Built 1887 as a circus building by J. P. F. van Rossem and W. J. Vuyk within eight months for the circus master, Oscar Carré. Opened 3 Dec 1887 as "Koninklijk Nederlandsch Circus Directie Oscar Carré". 1893 converted to a theatre by Le Jenne. Re-opened 1893 by a variety performance of Fritz van Haarlems Specialiteitengezelschap. Various later rebuildings. 1991-1993 major rebuilding of stage house by Onno Greiner and Martien van Goor; addition of a new studio stage, "Klein Carré" (100 seats). 2004 renovations. Main auditorium: 1700 seats (circus performances), 2000 seats (theatre performances). Used for musical performances, popular concerts, and for an annual circus season. 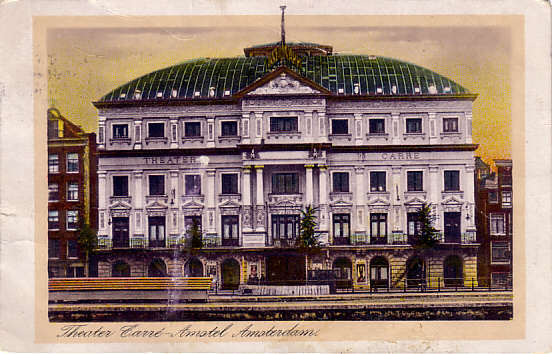 Front Text: "Theater Carré - Amstel, Amsterdam", inscription on building: "Theater Carré"